In just a matter of hours, Malaysia will enter what could be the biggest tussle for leadership yet: the 14th General Election (#GE14). Once again, the incumbent government faces a serious onslaught (its most critical since Independence, perhaps) as factions from the Opposition unite to mount a formidable challenge for rulership of the land. As the latter’s weapon of warfare looms in the shape of 92-year-old former Prime Minister, Tun Dr Mahathir Mohamad; the former continues to push its promises of cash and stability-in-the-status-quo to the masses. The rising costs of living hogs the spotlight this #GE14, but yet another issue coming to a head as voters go to the polls tomorrow, is the lack of affordable housing, especially for middle class urbanites known as the M40 (ostensibly because they form part of the middle 40 percentile). This is an issue most pronounced in the bustling urban constituencies of Kuala Lumpur, Selangor and Johor Bahru. Bank Negara in its quarterly bulletin in Feb 2018, noted that homes had become “seriously unaffordable” in 2016 by international standards. 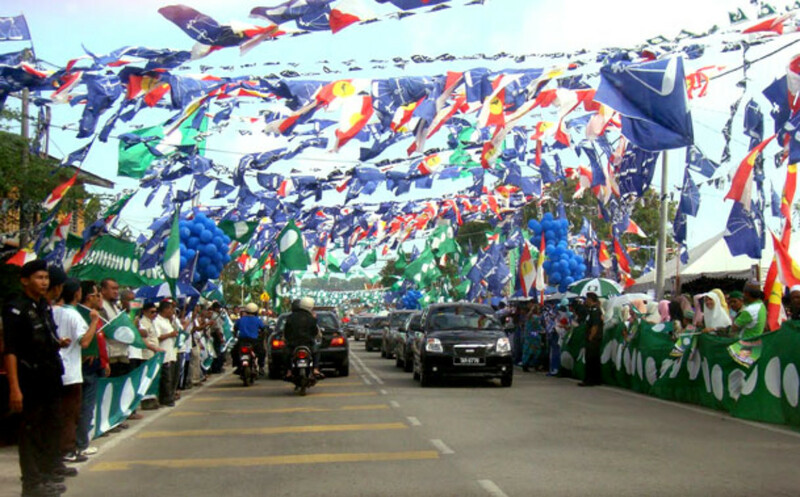 The local media has also reported extensively on the lacklustre performance of the Malaysian property market and now, with the spectre of the general election looming ahead, contesting parties have pledged to tackle housing affordability as part of their election manifestos. Not only is the M40 watching for the change(s) that could come with the #GE14; investors are paying close attention, too. Currently, investors are adopting a wait-and-see approach. Wealthy Malaysian investors are diversifying their money into real estate opportunities across residential and commercial properties both at home and overseas, as well as assets such as bonds and gold in light of a more cautious market and the upcoming general election. The general sentiment is that investments into local property could pick up after the election once the dust settles and new policies are put into place. Be that as it may, Knight Frank’s latest Wealth Report Attitudes Survey 2018 reveals that 43% of its Malaysian clients have plans to invest in properties overseas, going forward, with the top five overseas destinations being Australia, United Kingdom, Singapore, New Zealand and the United States. Interestingly, Malaysia tops the survey, followed by Hong Kong (40%), China (37%) and Singapore (30%). The rising interest in overseas properties investment is not surprising, given the favourable returns that investors get (our portfolio of property investments can offer up to 10% nett returns for 10 years!). “With the current property glut and wait-and-see approach adopted by investors, it is certainly a driver to continue investing abroad,” says Knight Frank Asia Pacific head of research, Nicholas Holt. 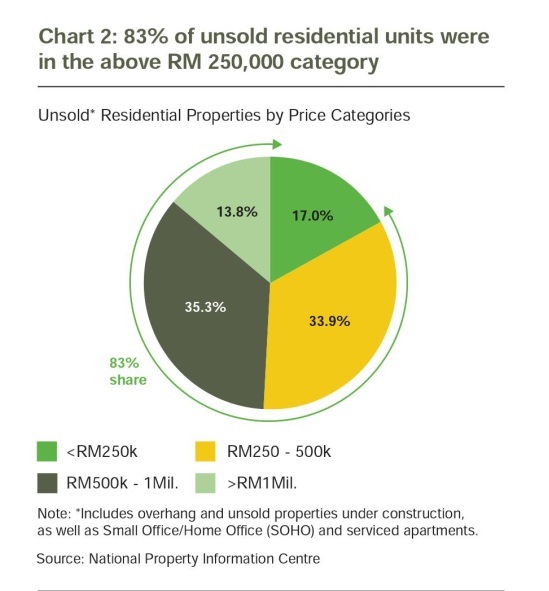 In a recent article in The Malaysian Reserve, Henry Butcher Real Estate Sdn Bhd COO Tang Chee Meng said that speculators and investors have been deterred by a host of issues including oversupply in certain locations, cooling measures by the government and cap on loan margins. The reduced interest from developers, he added, had resulted in more sluggish take-up rates for developers, thus contributing to the increase in the overhang statistics. Stagnating rental growth rates have also clouded the local property market. And, with new developments moving at such a rapid rate, the rental market is hard pressed to keep up. After tomorrow, the next few months will be crucial. The nation will be watching to see if promises are kept and if manifestos on bread-and-butter and housing issues will take effect in reality. To all Malaysians traveling to cast their votes this #GE14, CSI Prop wishes you a safe journey. Selamat Mengundi. Are British Accents A Reflection of the UK Housing Market? How do the Brits rate the many different accents in the British Isles and are they a reflection of the British property market? There is a sort of ‘pecking order’ to the accents found in the British Isles. But here’s the question: is this pecking order a reflection of the performance of the property market in the different cities in the UK? There is a common fallacy that surrounds the British accent, the misconception being that there’s only one. Well, there isn’t. If you were to do a quick analysis of English dialects, you will find that there are roughly as many accents in the British Isles as there are in the whole of North America – including Canada, Bermuda and Native American dialects. Drill deeper and you will find that there is one dialect per every 1.3 million people in the British Isles (vs. a rather unimpressive one in 10m people in North America)! This is a fact known to few, with many not even realising the huge variety in British accents, let alone the hilariously painful hierarchy associated with it. Thanks to YouGov, an international Internet-based market research and data analytics firm headquartered in the UK, the mystery to this social pecking order has been has unravelled. YouGov conducted a research based on the public’s ratings of the attractiveness of the 12 main British accents in the UK and found that the public has deemed the Birmingham ‘Brummie’ accent the most unattractive. A study by psychologists from Bath Spa University expressed the reason behind this prejudice: apparently, people with Brummie accents sound like crooks, and are viewed as less intelligent and less imaginative. Of course, these stereotypes are not rooted in science, and should not be treated as a true measure of intelligence. 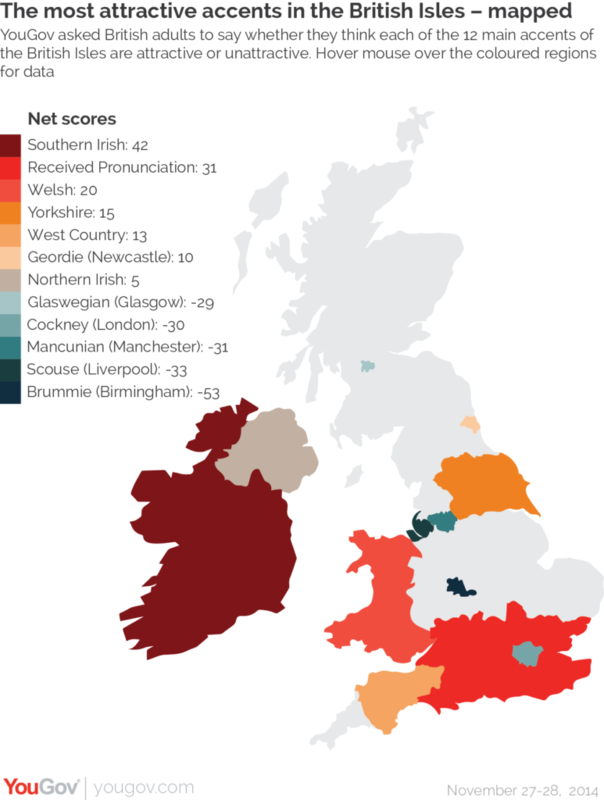 Interestingly, the Liverpool ‘Scouse’ and Manchester ‘Mancunian’ accents were the second and third worst, respectively. A good thing, then, that accents are neutralised in song, for Liverpool-born Paul McCartney and John Lennon of The Beatles, along with Mancunian Liam Gallagher of English rock band Oasis, might have had a harder time topping the charts! So, Which British Accent Won the Linguistic Battle of Appeal? Taking the top spot in YouGov’s research is the Southern Irish accent. Those keeping up with news on entertainment may have come across the likes of Saoirse Ronan and Cillian Murphy, whose speeches and interviews alone may well prove the report true. Quite surprisingly, though, Received Pronunciation (RP), the very accent of the Qqueen herself, came in second place with a considerable 11-point difference from the first spot. RP has quite the prestigious reputation with only 2% of the British population speaking it, all of whom are of high social standing. Waltzing into third place is the Welsh accent. A separate study by The Language Gallery revealed that people who speak with the Welsh twang were perceived as sounding happier than those with other English accents. Robert Downey Jr. has taken up the challenge of learning this jolly accent for his upcoming film, and Welsh fans are ecstatic about it. In the end, regardless of what the Brits themselves think, it appears that the rest of the world continues to marvel at the sophistication of all British accents. Lyndsey Reid, a Brummie-speaking writer at Business Insider in the US recounts that there really isn’t a “bad” British accent in America given the numerous compliments she has received since landing in New York. Her accent, she says, is a novelty that sets her apart in a positive way. Since her move to America, she has been asked to do presentations at events and provide an insight into the British English language. And, it is her voice that has been used in voice-overs for internal corporate videos. While their accents don’t quite meet the mark (at least among the Brits), Birmingham, Liverpool and Manchester have something else going on for them — their property market. Those keeping up with the news must be aware of the regional city rise, whereby house prices in cities outside London are experiencing greater growth than in the capital. 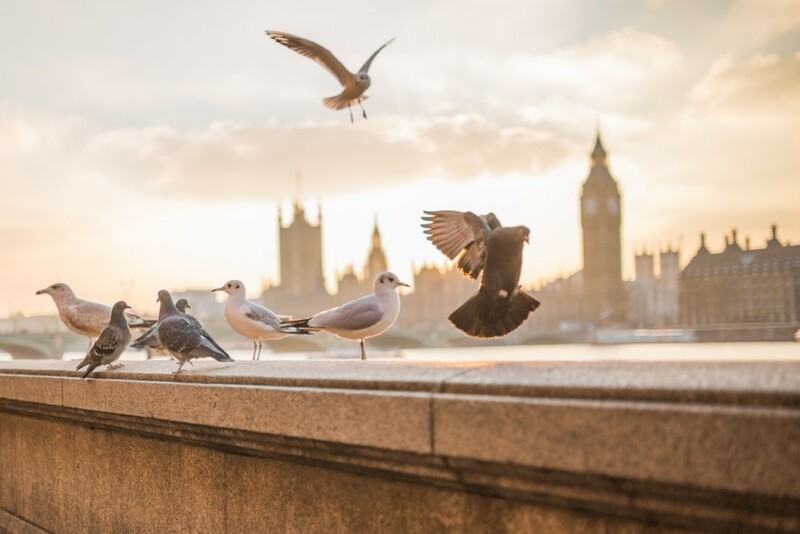 Shrewd investors would know that these three cities, while home to the UK’s bottom three accents, are actually subject to have some of the best house price growth rates in the UK. And, as such, we conclude that the scales have tipped in favor of the flourishing cities of Birmingham, Liverpool and Manchester. At CSI Prop, while we cannot offer lessons on the British accent, we can help you invest in some of the best properties the UK has to offer! Contact us at +603 2162 2260 to invest in properties Birmingham, Liverpool and Manchester. In less than a year, the UK will officially exit the EU. Here is an overview of the Brexit effect on the UK property market. Recently, popular actor Sir Patrick Stewart joined Members of Parliament and business leaders in London for the launch of a campaign called The People’s Vote. The campaign calls for a second Brexit vote, and drew some 1,200 people, including representatives from all of Britain’s major parties. The actor, who played Professor X in X-Men, and Captain Jean-Luc Picard in Star Trek: The Next Generation, had earlier said that both his iconic X-Men and Star Trek characters would have backed Remain. This provoked a retort from Boris Johnson, the British Foreign Secretary. Mr Johnson drew upon Star Trek’s famous line, saying that Brexit will enable the UK to “boldly go” to areas it has neglected in recent years as it seeks trade deals. On 29 March 2019, the UK will cease to be part of the EU as per the terms of Article 50. Taking into consideration the time needed for ratification by both the EU and UK, negotiations need to be complete by the end of 2018, or both parties risk a ‘cliff edge’ scenario where ties are suddenly severed with no arrangement as to how to move forward outside World Trade Organization (WTO) rules. The UK has long been a global superpower with London as the world’s financial, education and cultural centre — even before it became a member of the EU. The UK has long been a global superpower with London as the world’s financial, education and cultural centre, even before it became a member of the EU. Our position has always been that there will, undeniably, be risks and opportunities. And while uncertainty is bound to rock the housing and economic market, we are positive that the UK will adapt to changes caused by Brexit. The slowdown in the housing market is likely a short-term one as the lack of housing supply in the UK will not change overnight, thus there will continue to be opportunities for property investors. 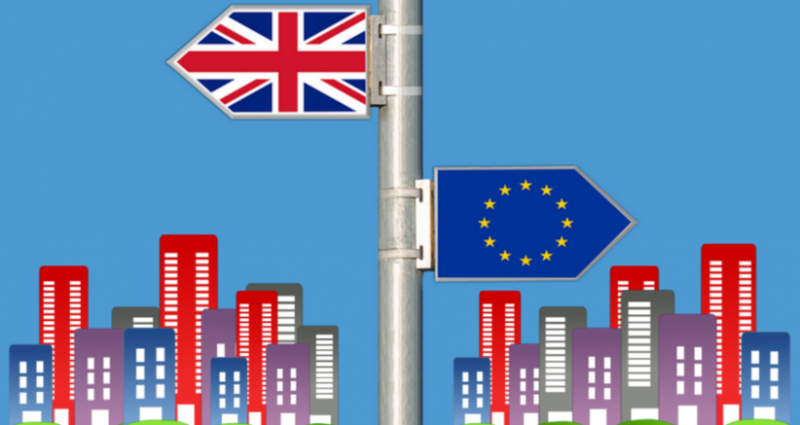 CBRE, in its Brexit Guide for Real Estate Decision Makers released last month (March 2018), echoes the sentiment and concludes that Brexit is not likely to have a significant impact on the property market. The British Prime Minister has said on many occasions that she would rather that no deal be made (in negotiations with the EU), than a bad one. CBRE calculates the probability of a no-deal Brexit scenario at around 25%. A no-deal scenario would mean the UK leaving on WTO rules, rather than continued preferential market access. Such an outcome could be damaging for the short-term confidence in the UK economy, especially if the UK is not well prepared. What is significant for the real estate market are the current negotiations on future trade and migration arrangements. Migration controls are likely to be tighter, but it is not clear yet to what extent the controls will be. In the 2017 General Election, the Government restated its target to cut nett migration to below 100,000 people per year. This will be challenging given that nett migration into the UK is currently more than double that amount, and added on to the fact that the Government wants to allow highly-skilled EU immigrants to continue to come to the UK. The reduction in immigrants could very well cause labour shortages and inflation. A shortage in labour affecting the construction sector could mean the slowing down of on-going developments, inevitably causing real estate demand to rise. This was implicitly recognized in the Government’s November 2017 Budget, in which £34 mil was allocated to retraining the unemployed to work in this sector. However, any attempt to tighten migration controls will not be made until 2021 at the earliest, given that the Government has made a commitment to import the entire body of EU law into domestic legislation, which will take a while. This will also mean that regulatory legislation for the property market is likely to stay stagnant until after 2021 as well. Tax change is not likely to differ either. Most taxes have been nationally-determined, with the exception of VAT and customs duties where the EU has specific influence. Thus Brexit will not induce much change in that regard. 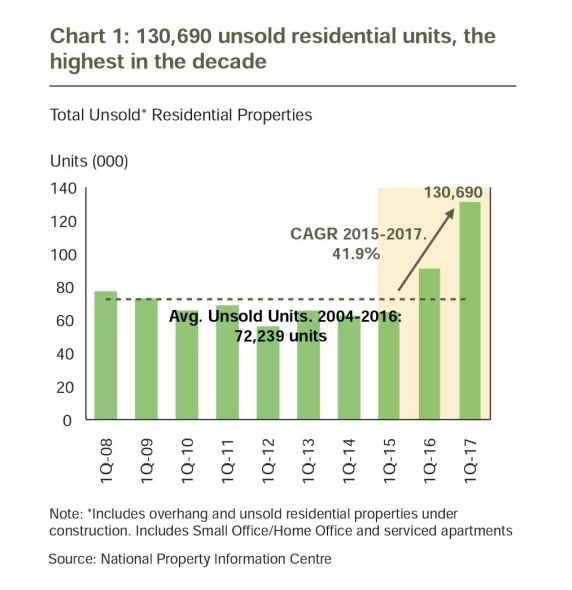 The residential property market is on the road to recovery, going up by 34% from the post-crisis sales rate, which was about 1.2 million sales in 2017. First-time buyers have increased from the long-term average of 41% to 48%. This can possibly be attributed to the Government’s Help to Buy program, which provides more accessible financing for those looking to purchase residential property. Movers are hindered by a lack of stock coming onto the market, and this trend is most pronounced in London. CBRE predicts that house price growth will slow to around 1.5% in 2018, but rally in 2019 and reach 17.1% in the next five years. Commercial student accommodation is set to be a growth area, with or without a Brexit deal. Research from Cushman & Wakefield showed that the supply of studio rooms has more than doubled since 2014. In 2017 a record-breaking 30,000 bed spaces were provided. However, supply is still not keeping pace with the growth of students in recent years. CBRE’s research shows that there still is much headroom for further provision of student accommodation in many cities in the UK. CBRE’s valuation index of 65,000 bed spaces reached double-digits, with total returns at 11.9% in the 12 months to Sept 2017. This significantly outperformed the Investment Property Database (IPD) All Property Index at 9.5%, which provides an indication of investment performance for the entire real estate market as a whole. Nett rental growth of the index reached 4.1%, which was pushing double the IPD ERV (Estimated Rental Value) growth, at 2.2%. Future demand for student property is likely to increase as latest UCAS figures show that student applications have gone up. The number of applications by EU and international students for university places in the UK increased to over 100,000 for the first time in 2018, a rise of almost 8% compared to last year. From this it can be seen that Brexit is irrelevant to students looking to further their studies, and the UK remains a popular place due to the reputation it has for quality tertiary education. Healthcare real estate investment hit record prices in 2017, reaching double (£1.4bn) that of the whole of 2016 (£720m) in just January to October. A majority of investments went into commercial care homes, far surpassing the rest of the healthcare sector. The large disparity of care home supply and demand has driven investments in this area. The UK’s population is ageing rapidly and existing facilities are already unable to cater to the current demand. There is also a lack of support for sufferers of dementia, a demographic which is also increasing rapidly. We can see more real estate investment trusts (REITs) starting to focus on this in 2018 and beyond. AXA’s acquisition of Retirement Villages and L&G’s acquisition of Inspired Villages and Renaissance Villages were all purchases involving established operators with development pipelines. The current uncertainty in the air continues to dampen confidence and growth in the UK’s economy. Currency-induced inflation has not yet fully dissipated, slowing consumer spending. Yet, as we have said previously, the weak pound has attracted a good number of international real estate investors to the UK, increasing demand for property. The weak sterling provides investors with a great opportunity to get into the UK property market right now, and cash in later when the market regains its footing. Certain sectors like commercial student property and commercial elderly care homes are Brexit-proof due to the high demand and low supply, regardless of whether the UK does or does not exit the EU with a deal. These sectors also have the advantage of being accessible to the individual investor and not just REITs, with their availability to be purchased in affordable units. 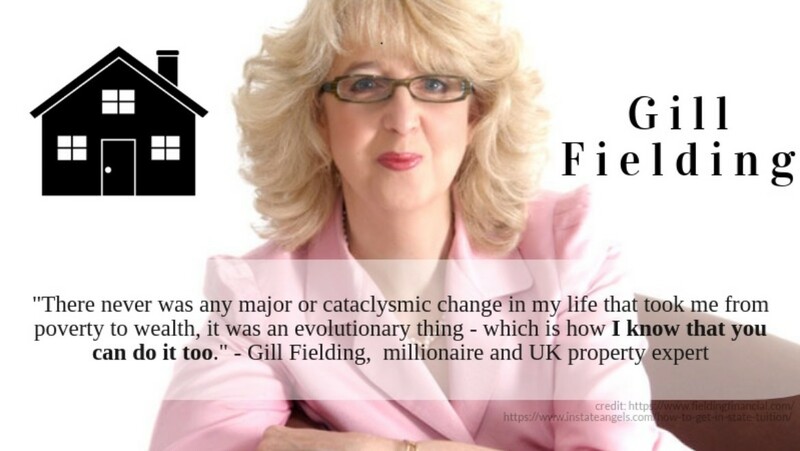 UK Millionaire Gill Fielding on her wealth: “My wealth has come gradually and organically — starting with property. Meet Gill Fielding, expert at all things UK property and founder of Fielding Financial, a UK-based company that specialises in providing financial planning, wealth management and mortgage solutions — did we forget to mention her millionaire status? The qualified chartered accountant co-founded Fielding Financial on the basis of a personal mission: to educate the nation in managing and improving their own financial position. The company strongly believes that the quickest and most reliable method to attain this is through property investment, especially in the UK, where Fielding herself has invested in multiple projects. Take a peek at UK’s property outlook for 2018 and see why the property market there will continue to prosper and fetch great yields well into the future. It goes without saying that a great number of investors have also acquired wealth through the same means as Fielding; a closer look at various types of investments shows that the odds truly are in your favor when investing in property (in the right places, of course). Oh, and in case you didn’t know, the three best buy-to-let hotspots in the UK that are set to offer the most competitive returns in 2018 are Manchester, Liverpool and Gateshead — something we have said so over and over in the past. The beauty of property-investing is that anyone can do it, even with no start-up capital. Experienced agencies can teach you how to get started, even if you don’t have a deposit. Properties are always in demand because there is a huge undersupply of homes in the UK. This means that even when there is a dip in the market, property prices often quickly bounce back up. 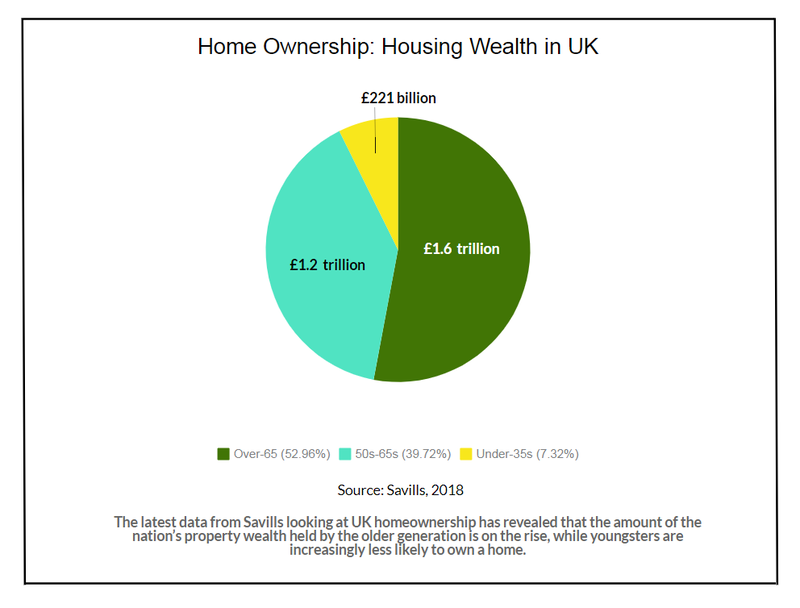 Due to the high demand for rental homes in the UK, a property portfolio can give your children (and future generations) a guaranteed income that a pile of money can’t provide them. Fielding’s fellow Brit and property millionaire, Rob Moore shares a common goal with her: to help bring to light the immense potential of the property market. Moore’s story is a compelling one. 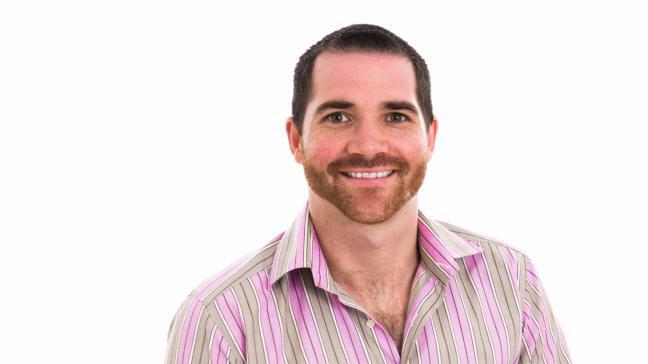 Investing in UK property had not only saved him from a £50,000 debt; it generated enough income to transform him into a major property millionaire. And it all started when a gallery owner urged him to attend a property networking event, insisting that most people on the rich list are in property. True enough, Moore now stands among the wealthy, with many people looking up to him for financial guidance. Here are some of his tips for success, serving as a guide for beginners and a reminder for experts. Decide what percentage of your income you will live off, save and never touch, then invest. After your income increases, change your plan accordingly; the challenging part, of course, is to never break these rules. Get perfect later, start investing and learning now! Listen to podcasts, read books, take up courses and consult experts — the more you learn, the more you earn! Ready and looking to invest in your first (or second or nth) property overseas? We’re here to help you invest (and possibly become a millionaire if you aren’t already). We have fabulous portfolio of Australian and UK residential and commercial property to choose from. Call us! Care Homes Investment: Where is the UK’s Oldest Population? Areas with a large older population face greater demands in terms of health and social care provision. Over the past two decades, the average age of a UK resident has risen by 2 years, to 40. 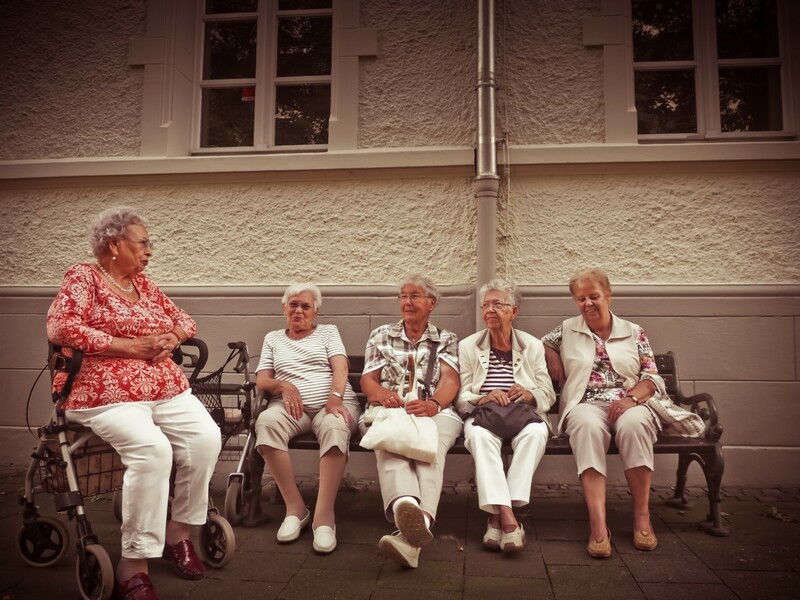 Within 30 years, 1 in 4 people is expected to be aged 65 and over. Freshly released data from Centre for Cities reveal where the youngest and oldest populations in the UK are concentrated. Recent figures predict one in six Britons alive today will live to a century. The number of centenarians in the UK currently stands at 15,000 and the predicted growth of this older population is staggering. The population of people aged 90 and over has grown more rapidly than other age groups in recent years with forecasts revealing that around 10 million people alive today will reach their centenary! Such findings have prompted the UK government to allot more than £300m to support the ageing population. Business Secretary Greg Clark announced that £210m will go towards the development of early diagnostic tools and innovative treatments while £98m will be spent on a ‘healthy ageing programme’ designed to help the elderly with the quotidian affairs that come with old age. In conjunction with the government’s ambition to tackle dementia, England’s leading cause of death, another £40m will go to a dementia hub that will be established in London in partnership with University College London. The hub will host 350 leading scientists researching new treatments for the debilitating disease, supporting the government’s agenda to have the best dementia care internationally by 2020. Freshly released data from Centre for Cities reveal where the youngest and oldest populations in the UK are concentrated. According to the independent think tank, over the past two decades, the average age of a UK resident has risen by two years, to 40. Within 30 years, one in four people is expected to be aged 65 and over. While the youngest population in the UK reside in Slough with an average age of 33.9, the oldest population belongs to Blackpool, a seaside resort on the Irish Sea coast of England with an average age of 43.2. Following Blackpool are fellow coastal cities: Worthing (43), Bournemouth (42.8) and Southend (42.2). More than one in five residents of each city were 65 and over in 2016 — this seems to illustrate the attraction of the seaside for those in retirement and welcoming their sunset years. Areas with a large older population face greater demands in terms of health and social care provision. The 2017 Health Profile for Blackpool reveals that the health of the people there are generally worse than the England average. 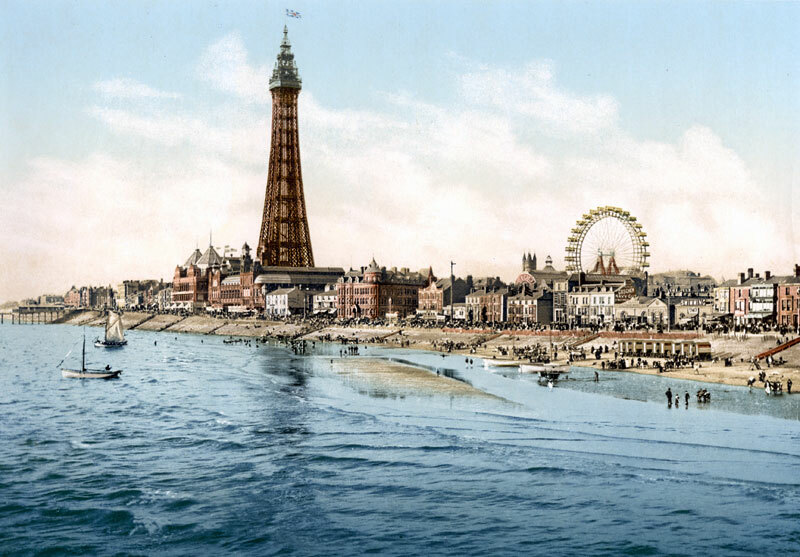 According to a report by Joint Strategic Needs Assessment (JSNA), Blackpool has a higher recorded prevalence of dementia in those aged over 65, with a 3.4% population in Blackpool compared to 3.2% nationally. Not surprisingly, the majority of admissions to care homes in Blackpool is due to dementia. 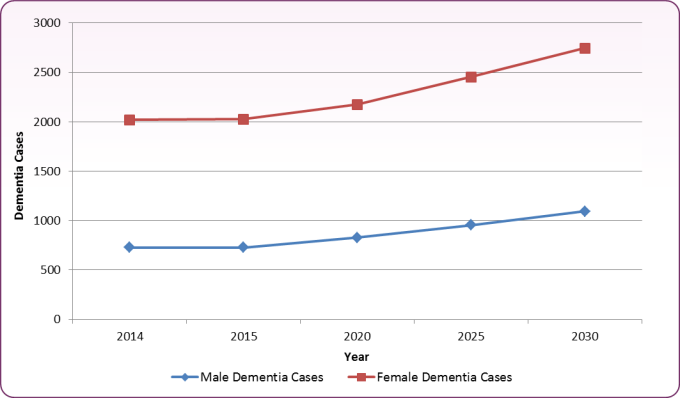 The UK is alarmingly ill-prepared for this rapidly growing population, as JSNA reveals that even family carers of people afflicted with dementia themselves are infirm. This called for NHS to treat dementia as a priority area and thus, a National Dementia Strategy was launched in 2009. However, in 2011, NHS Blackpool conducted a survey of local GPs which suggested that dementia care of every degree still has many serious improvements to make, particularly towards the development and implementation of local care pathways and education programmes to meet GP requirements. Overall dementia care in Blackpool must improve and expand dramatically to tackle the increasing number of people with the disease. Blackpool has a higher recorded prevalence of dementia in those aged over 65, with a 3.4% population in Blackpool compared to 3.2% nationally. Not surprisingly, the majority of admissions to care homes in Blackpool is due to dementia. Image by JSNA BLackpool. The JSNA report also stated that the next common health crisis besetting the older population in Blackpool is depression, with depression rates expected to rise in the following years. Again, it must be stressed that well-equipped and well-staffed care homes that cater to a range of diseases besetting the elderly, is not confined to Blackpool; the media is fraught with news of poorly-run and ill-equipped care homes across the UK. Thus, the UK care sector is in urgent need of dementia-specific care facilities and nursing, with several being closed down due to an inability to meet Care Quality Commission guidelines and regulations. Moreover, care homes of substantial quality are particularly in high demand! What inevitably trails such conditions is a thriving market that benefits investors. 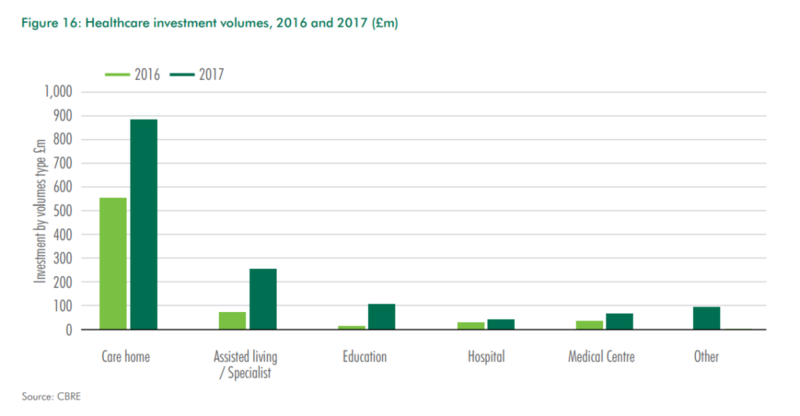 It is evident that high demand and seemingly perpetual relevance will continue to propel the care home market forward, and a weighted analysis of the yields will undoubtedly manifest the immense potential of this asset class. Care for the elderly generates in excess of £14.5 billion for the UK economy. According to The National Audit Office’s 2014 report into Adult Social Care, care needs are climbing. Effectively, the government is predicting that 1.7m more adults will require some form of care and support over the next 20 years. Given its escalating demand, property group Knight Frank has placed care homes at the top of the list of high returns from property in the health sector, where yields of up to 10% are common. Aside from rewarding returns, this commercial property investment also offers an exit in the form of a sell-back option to the developer at an appreciated value. Carlauren Lifestyle Resorts Blackpool, once completed, will be one of the latest lifestyle quality care homes in Blackpool, offering investors 10% returns assured for 10 years. Exit is available from year five onwards. Alongside access to 24/7 care home packages, the luxurious 61-studio care home scheme located on Blackpool’s seafront boasts spectacular sea views, fine dining and bar, cinema, hair and beauty salon, and spa. Feel free to contact the team at CSI Prop for more information and how to build an impressive property portfolio. The number of international applicants into UK universities rose by 11.1% to 58,450, the highest number on record. 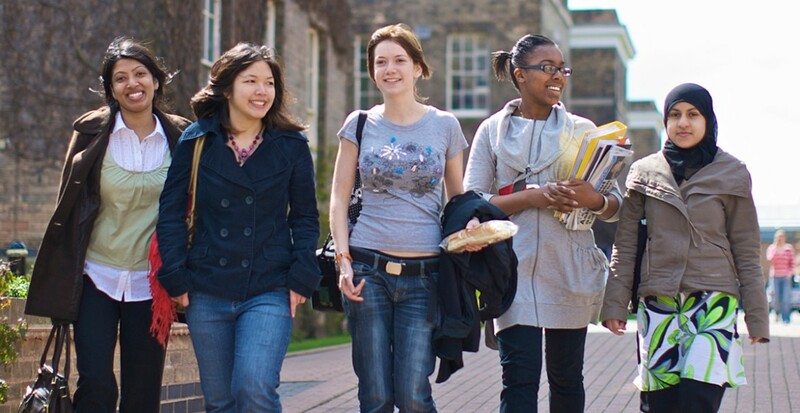 Latest UCAS figures show that the number of applications by EU and international students for university places in the UK has increased to over 100,000 for the first time – this is a rise of almost 8% compared to last year. UCAS (The Universities and Colleges Admissions Service) operates the application process for a large number of universities in the UK. Its figures show that the number of EU applicants increased by 3.4% to 43,510. Last year, the number of EU students applying to British universities fell by 7%, right after the Brexit vote results. Meanwhile, the number of international applicants rose by 11.1% to 58,450, which is the highest number on record. HESA figures show that over the past decade, non-EU international applicants rose the highest, by 70%, compared to EU students at 48% and UK students from outside the region at 24%. Amongst international students in the UK, the highest numbers come from China, Malaysia and Hong Kong. Latest statistics place China, Malaysia and the US as the top three foreign student nationalities in the UK. One factor contributing to the increase in overall applications is the weaker pound. Since the UK voted to leave the EU on 23 June 2016, the pound had devalued sharply, falling by as much as 21% per cent against major currencies. This makes studying in the UK a more affordable option for foreign students seeking a British education, particularly those from countries with lower exchange rates compared to the sterling. 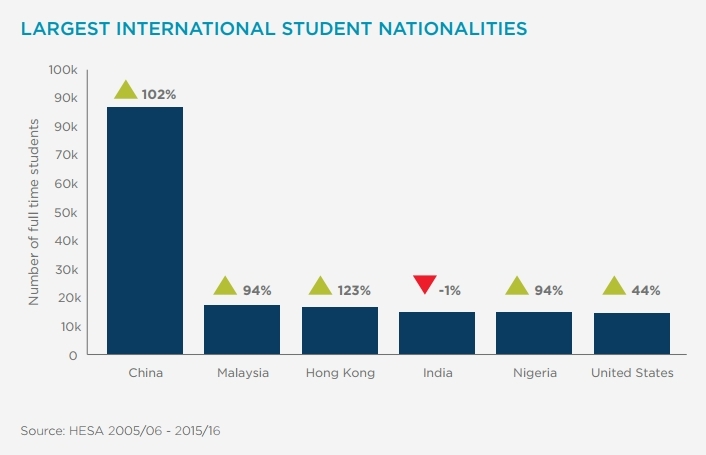 Amongst international students in the UK for the 20015- 2015 period, the highest numbers come from China, Malaysia and Hong Kong. Latest statistics place China, Malaysia and the US as the top three foreign student nationalities in the UK. Chart by Cushman & Wakefield Student Accommodation Report 2018. An explanation for the rise in EU students, in particular, could be the reduced tuition fees that they currently qualify for. Prospective students could be making a last-ditch effort to secure places in a British university before the UK formally leaves the Union, and the subsequent increase in fees. The Government had announced that EU students starting in this academic year would be entitled to reduced fees and funding support for the duration of their course, even after the UK leaves the Union. EU nationals who have resided in the UK for over five years are also able to apply for undergraduate maintenance support and postgraduate loans. Ultimately, British universities continue to be world-renowned and sought-after for their quality education. The prestigious University of Oxford and Cambridge are ranked number one and two, respectively, in the Times World University Rankings 2018. A total of 31 British universities managed to rank in the top 200 worldwide. For quite some time now, university-managed accommodation in the UK have been unable to keep pace with student numbers, giving rise to privately-managed purpose-built student accommodation (PBSA). The popularity of PBSAs has also been boosted by a more discerning and affluent student population, which demand a higher standard of living than private landlords in the UK can provide. PBSAs are typically located close to universities and the city centre, and are well-equipped with a myriad of amenities. This rapid increase of EU and international students, upon the backdrop of declining numbers of UK home students, will continue to fuel the need for commercial student property, granting investors a brilliant opportunity for investment in one of the UK’s top performing asset classes. One up-and-coming PBSA development in the Liverpool city centre, Natex, is a impressive 566-unit student residential scheme, approximately 5 minutes walk from two of the UK’s top universities (University of Liverpool and Liverpool John Moores University). It offers a unique opportunity for commercial property investors with 9% nett rental returns assured for 5 years. Construction is poised to begin in Aug 2018, and completion is expected in Q3 2020. UK residential and commercial property landlords must abide by minimum energy efficiency standards effective today or face fines. Hundreds of thousands of UK residential and commercial landlords could face fines for failing to make their rental homes more energy efficient once legislation comes into force. The regulation takes effect today (1 April) for new rental lets and renewals of tenancies, and for existing tenancies, on 1 April 2020. A fine of up to £5,000 can be issued for those renting out homes that fall under the lowest F or G rating in the Energy Performance Certificate (EPC). Under the law, it is illegal for landlords to rent out property that breaches the requirement for a minimum E rating unless exemptions apply. Like the Landlord Licensing scheme (if you are a landlord, read about the scheme here), the requirement for energy-efficient homes is not news, having been set out in The Energy Efficiency (Private Rented) Property Regulations 2015, and the onus for compliance rests with property owners and landlords. 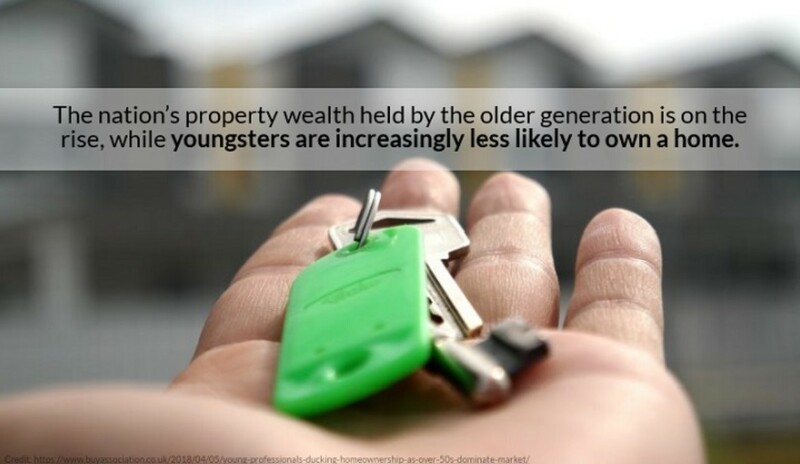 The older the property, the poorer its energy efficiency is likely to be. Landlords with homes built in the Victorian era and early part of the twentieth century ias particularly at risk of being caught out as these types of property are often most lacking in insulation. The Department for Energy and Climate Change said when it announced the move that 65% of F and G EPC rated private rentals were built before 1919. Many properties that are F or G rated could be made compliant just by making one change. For example, 40% of privately-rented properties could be improved above an F or G category just by installing loft insulation. Chief executive of ARLA Propertymark, David Cox, says: “There isn’t a huge amount of awareness among UK landlords and tenants on the energy efficiency laws. However, statistics seem to suggest that landlords are behind in getting their properties ready for the deadline. Monthly data by the Association of Residential Letting Agents (ARLA) show that overall rental properties managed by letting agents fell by 5% in February compared to January, the lowest level since May 2016. Cox explained that the drop in rental supply indicates that UK landlords are cutting it fine and removing their properties from the market to make the necessary changes before the regulation takes effect. “We could see up to 300,000 properties taken off after the deadline passes because they don’t reach the minimum requirements,” he warned. It will, however, be difficult to know how UK landlords will be policed, says Cox, adding that less than 500 landlords are prosecuted every year and adding new laws is unlikely to improve prosecution rates. UK property landlords can find out about recommended improvements for their property by checking their Energy Performance Certificate Recommendations Report, or obtaining a Green Deal Advice Report. There are many options for financing under the Green Deal and even receiving free insulation work under the Energy Company Obligation. The Department of Energy and Climate Change claims that increasing a property’s energy efficiency could increase its market value. Data shows that the average annual cost of energy for an EPC band G property is £2,860, and £2,180 for an F rated property. This contrasts with an average annual cost of £1,710 for an EPC band E property. 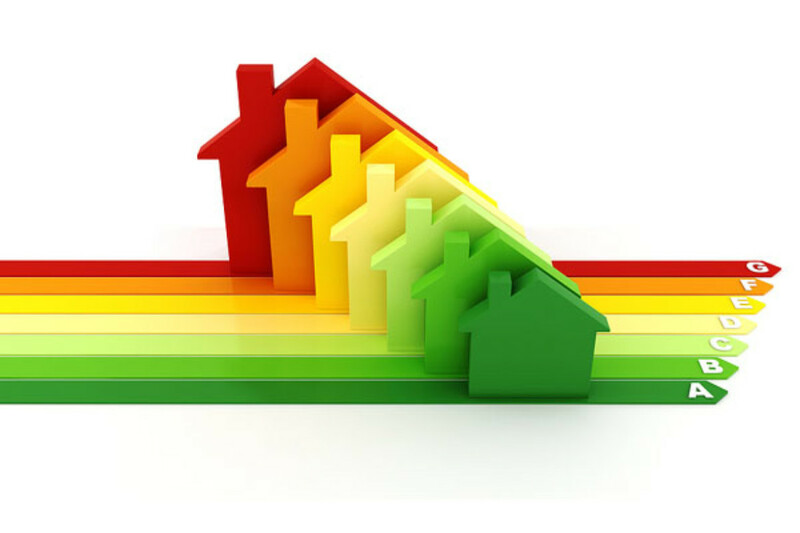 Therefore a tenant whose home is improved from EPC band G to band E could expect to see their energy costs reduced by £1,150 a year so long as there were no wider changes in how they use energy in the property. Research by AXA Business Insurance found the improvements most sought after by tenants were enhanced energy efficiency, through tools such as insulation, newer boilers or double-glazing. Ultimately, it will result in cheaper heating and better quality of homes for tenants. However, at a time of consistent government change, increasing ambiguity and various tax increases, the proposed cost of changes at £2,500 per property is going to put further pressure on landlords, especially those outside the prime rental markets in London and the South East,” said Cox. A new survey on the UK’s 24 leading urban economies saw Liverpool rated as one of the top four hotspots in the UK for economic growth potential. Liverpool’s economic growth rate, coupled with investments into the city’s development and infrastructure, is poised to create more jobs, further driving demand for housing and cementing its reputation as one the best-performing property investment locations for landlords. 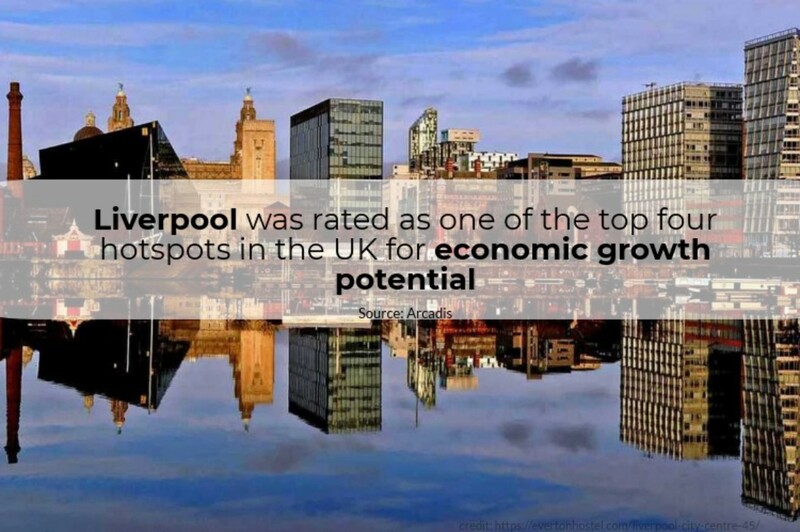 The results of a survey on the UK’s 24 leading urban economies saw Liverpool rated as one of the top four hotspots in the UK for economic growth potential. The study was executed by a global design and infrastructure consultancy known as Arcadis. To achieve the rankings, six key features of a prospering city were calculated and compared: workforce and skills, infrastructure, business environment, place, city brand and housing. Liverpool was ranked within the top four economic hotspots together with Edinburgh, Oxford, and Cambridge. The report was welcomed by both City Region Metro Mayor Steve Rotheram and managing director of the Liverpool City Region LEP, Mark Basnett. The report revealed that Liverpool’s strengths were its brand, infrastructure, positive business environment and quality and affordability of housing supply — the latter has earned Liverpool a considerable number of titles as one of the UK’s best buy-to-let areas. A look at Liverpool’s economic history reveals that its position at the top of a list on economic growth is not some newfangled occurrence. In 2015, figures by the Office for National Statistics (ONS), revealed that Merseyside, a metropolitan county that comprises Liverpool among other cities, experienced an economic growth rate faster than London, Manchester and any other major British city. Just last year, Liverpool was voted as ‘The UK’s Buy-To-Let Hotspot’ for property investment returns and capital growth. With this positive trend extending into 2018 along with major regeneration schemes, Liverpool and economic growth are set to be well-acquainted in the years to come. Liverpool’s strengths were its brand, infrastructure, positive business environment and quality and affordability of housing supply. What will further catapult Liverpool’s economic progress is the Knowledge Quarter, a £2bn vision to establish the city as one of the world’s leading districts for science, technology, innovation and education. For this goal to be actualized, it is crucial for well-resourced and world-leading universities to take the lead due to their resources and conducive environment. What is usually forgotten is that labs and classrooms are the birthplace of pretty much all the latest technology. AI and deep learning, automation and predictive analytics have all, in some form, started in an educational institution and not a traditional software development environment. The Knowledge Quarter is a perfect example of the UK’s progress towards this major goal, marking its transition into the next digital revolution and cementing Liverpool’s position as one of UK’s core cities taking part in it. With several universities already residing in Liverpool’s Knowledge Quarter, a growing student population is bound to follow — Liverpool is home to a whopping 67,000 students! This shortage, a burgeoning student population and the relevance of the Knowledge Quarter as a one-stop education and technology centre, make PBSA in Liverpool the ideal investment. Opportunities for investment are also found in the residential property sector as high house rental values have given Liverpool’s city centre some of the highest rental yields in the UK. According to latest research, Liverpool and Nottingham were the best performing property investment locations for landlords with average nett rental yields of 6.2%, no doubt greatly credited to the education sector. With Paddington Village, a massive regeneration scheme within the Knowledge Quarter, poised to create up to 10,000 jobs and fuel demand for housing, we see this trend continuing into the future. With Liverpool’s Knowledge Quarter and education centres in mind, it would be a good idea to dip your toes into the pool of Liverpool’s looming success as soon as possible! Feel free to contact the team at CSI Prop for more information about how to get involved with Natex and how to build an impressive property portfolio.